AMES, Iowa – A multi-year study led by an Iowa State University scientist suggests the turbines commonly used in the state to capture wind energy may have a positive effect on crops. Gene Takle, a Distinguished Professor of agronomy and geological and atmospheric sciences, said tall wind turbines disbursed throughout a field create air turbulence that may help plants by affecting variables such as temperature and carbon dioxide concentrations. Takle and his team installed research towers on a 200-turbine wind farm between Radcliffe and Colo. The research towers collected data from 2010 to 2013 on wind speeds and directions, temperature, humidity, turbulence, gas content and precipitation. The project aimed to discover how the turbulence created when wind moves through the turbines affects conditions at ground level where crops grow. Takle said the team’s data show that the wind turbines have a measurable impact on several key variables that affect growing conditions. It’s more difficult to pin down whether those changes affect crop performance, but Takle said wind turbines may make growing conditions more favorable for corn and soybeans. “On balance, it seems turbines have a small, positive impact on crops,” he said. Takle said turbines can change the temperature in the areas around them. The research team’s data show that turbulence produced by wind turbines leads to temperatures about a half degree cooler during the day and between a half to a full degree warmer at night. That’s because the turbulence mixes air at different elevations. That mixing cools the ground level during the daylight hours, like a fan blowing on a wet surface, Takle said. But at night, as the ground loses heat, the mixing brings warmer air aloft down to ground level, resulting in a net warming effect. The turbulence also suppresses the formation of dew and dries the crops, Takle said, which could combat harmful molds and fungi. The turbulence, and the associated changes in air pressure at ground level, also may enrich the carbon dioxide content in the air surrounding crops, which could make the plants grow more efficiently, Takle said. Takle said the researchers set out to determine if wind turbines impact the factors that influence growing conditions in a field. The answer appears to be yes, but he said figuring out if those changes actually improve plant performance poses a bigger challenge. The research was supported by a $1.3 million grant from the National Science Foundation. 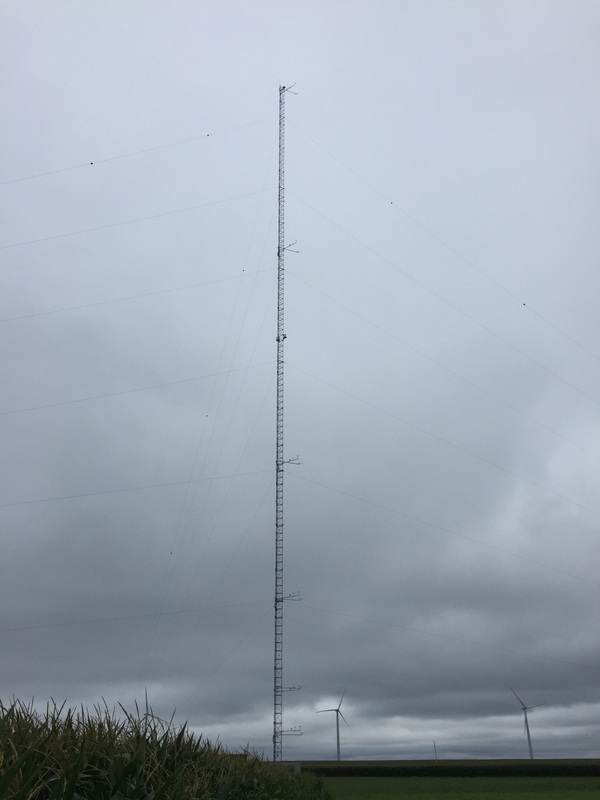 ISU researchers used data collected from towers equipped with scientific instruments to study how the turbulence caused by wind turbines affects growing conditions in corn and soybean fields. Photo courtesy of Gene Takle. Larger image. Turbulence created by wind turbines may help corn and soybeans by influencing variables such as temperature and carbon dioxide concentration, according to Iowa State University research. The project drew on data generated by research towers set up on a 200-turbine wind farm in Iowa.